12 years ago I embarked on a journey that changed my life forever! I posted my first recipe (Methi paratha) on 4th August 2006 here on My foodcourt. I started My Foodcourt as an online journal to document the recipes that I have learnt along with my experiments in the kitchen.I am surprised and amazed at all the wonderful opportunities that this blog has brought into my life ever since. Thank you all for your continued support and encouragement. Today, My Foodcourt turns 12 and I have a special surprise for you. A guest post by a special friend! Medha is a fantastic cake artist, a magician and creates mind boggling pieces of art in the form of cakes and desserts. Her creativity just blows me away each time. Her labour of love PieceO’Cake is a gourmet home bakery specializing in customized cakes and desserts. If you haven’t seen her work please do see it here and here. I have to warn you, you are in for an addictive visual treat! Most of the times I am overwhelmed just reading the description of her artistic creations! To celebrate the blog anniversary, Medha is sharing her recipe for this stunning Swiss roll – Hurricane Swiss roll. Simple and stunning that’s how I like it J Thank you tons Medha for the recipe, beautiful photos and yet another stunning treat! 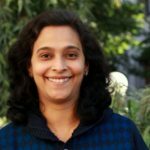 Over to Medha When I got a call recently from my friend Madhuli, I was both excited and terrified at the same time. Excited because she wanted me to write a guest post for her blog anniversary…terrified because she wanted me to write! I mean i can make as many desserts for you if you ask …but asking me to “write” a blog post is quite worrisome… for me! But then you can’t refuse good friends and you can manage to overcome your fears for them…. so here I am …writing a blog post! 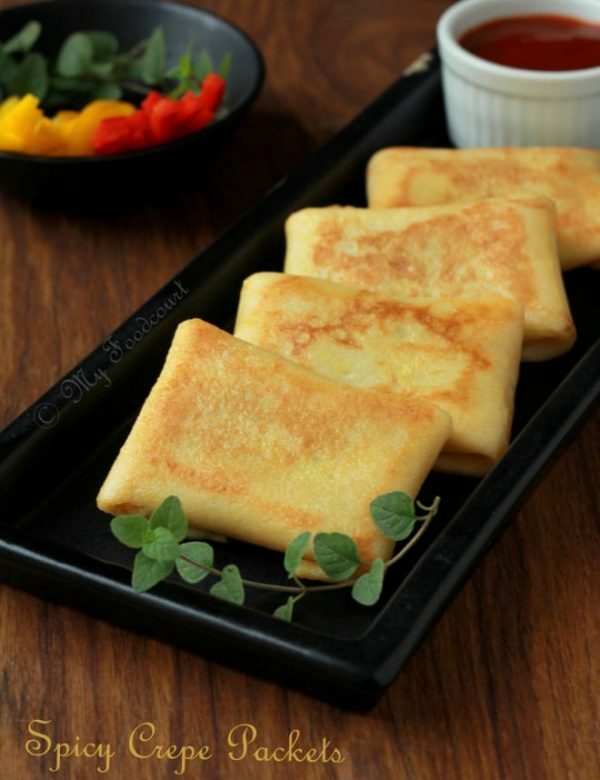 Madhuli specially requested that the recipe be simple yet look good at the same time. 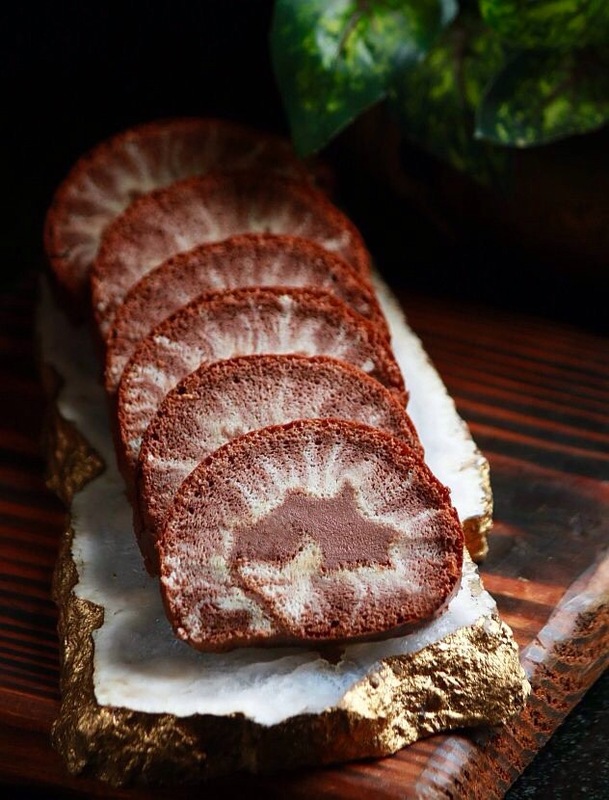 Here is a Hurricane Swiss Roll that has become the latest Instagram challenge/ trend of sorts. 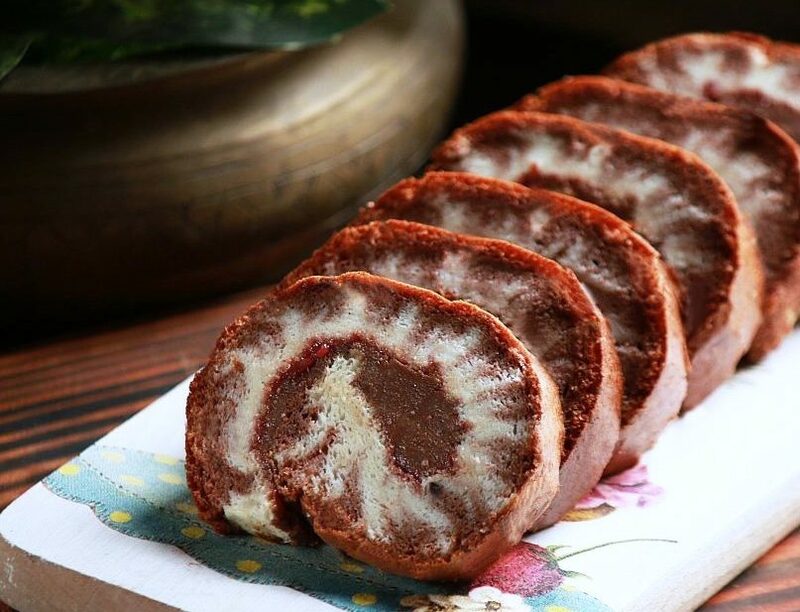 It is nothing but a chiffon sponge roll comprising of contrasting layers of swirls that look like a hurricane and hence the name. This is achieved with a small technique applied at the final stage before baking to give it the hurricane effect. Mind you it is a very easy recipe but your first attempt may not end up looking so perfect…I too needed a second attempt at getting a more prominent hurricane effect. But irrespective of the optics the cake turns out moist and oh so tender…a perfect accompaniment to your evening cuppa! Part A : Mix the warm milk and cocoa powder until a smooth paste is formed, set aside. Sift flour and salt and set aside. In a clean bowl lightly whisk egg yolks, sugar and vanilla extract. Add oil and milk and whisk until foamy. Slowly add the flour and whisk until well combined. Now take out 1/3rd of the yolk mixture ( approx 90gms ) and mix it with the cocoa paste and set aside. Part B: In another clean bowl beat the whites until foamy and then slowly add the sugar until soft peaks form. Do not beat it to the stiff peak stage. Now take out 2/3rd of the meringue and fold it in two batches into the vanilla batter. Fold the remaining 1/3rd meringue into the cocoa batter. Pour the vanilla batter into the prepared baking pan and spread evenly and level it with the help of a cake scraper or spatula. Fill the cocoa batter into a piping bag and evenly pipe it all over the vanilla batter. 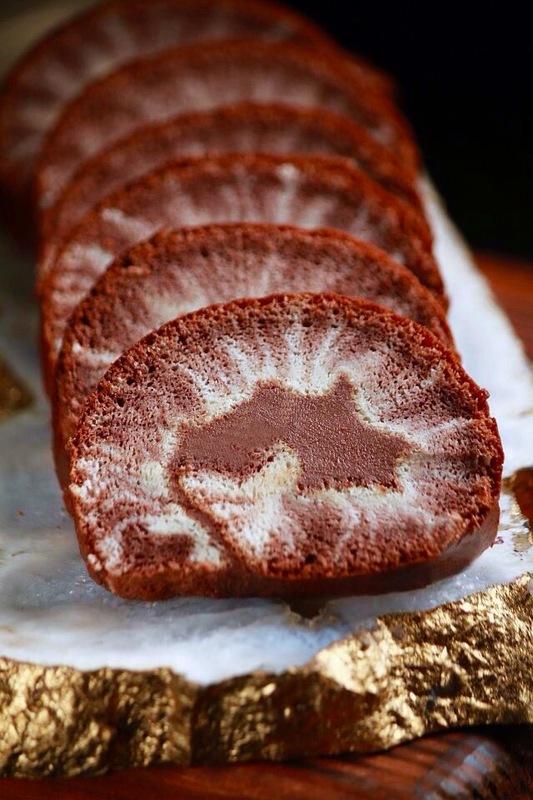 You can directly pour the cocoa batter and spread it evenly over the vanilla batter, but it is very tricky to do that, hence the piping technique. Now this is the interesting and important stage to get that hurricane effect - using the thick end of a chopstick or the end of a spatula, draw vertical lines from top to bottom and then horizontal lines from left to right without lifting the chopstick/spatula. The lines have to be close in order to achieve a good pattern. Tap the pan a few times to get rid of any air bubbles. Bake in a preheated oven @160 C for approx 25-30 minutes. The cake should be well risen and uniformly browned with a shiny skin. Check for firmness by tapping your finger on the surface of the cake and if it springs back its done! Remove the cake from the oven and place on wire rack to cool for 5 minutes Then invert the cake ( so that the chocolate side is facing down) onto a clean sheet of parchment paper. Remove the parchment (used for lining) from the sides and top. Wait another 10 minutes for the cake to cool. For the filling I used a thin coat of raspberry compote/jam and then topped it off with dark chocolate ganache. 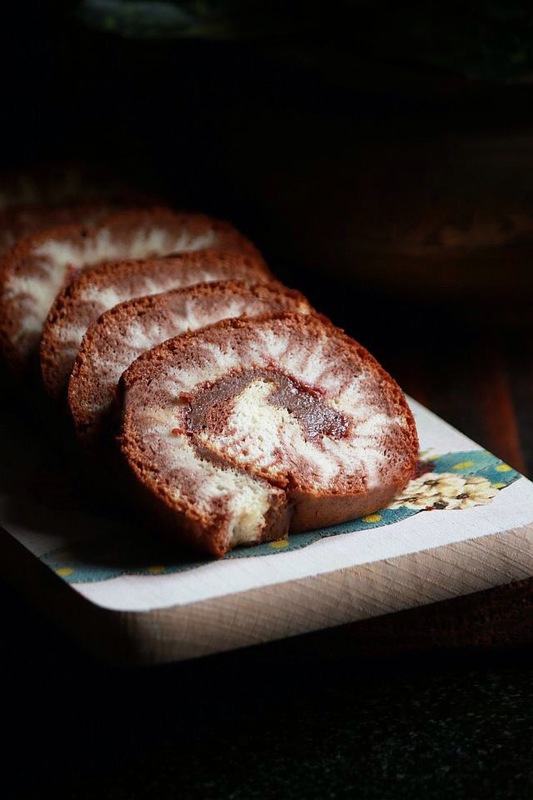 You can use anything like whipped cream , buttercream or jam as a filling for your roll. Once the cake is cooled spread the filling evenly over the surface and roll it as tight as possible with the help of the parchment paper. To achieve a decently shaped roll without cracking the skin takes practice. Once rolled, cover the cake along with the parchment paper in a plastic bag or cling wrap and refrigerate for atleast 3-4 hours. Once chilled remove from the refrigerator, trim off the edges and cut even slices and serve! You may think that the next best option is to eat..... Nah! You can't eat it just yet if you are a blogger or instagrammer.... another stage of photography shall follow until you or your family is allowed to eat the cake! Hope you all like it and give it a try....Enjoy! You can substitute the cocoa powder for any other flavour/powder of your choice, like matcha green tea, beetroot powder, freeze dried fruit powders or activated charcoal powder. Congratulations my friend! Such a joy to see your work always and to see Medha’s awesome work too! 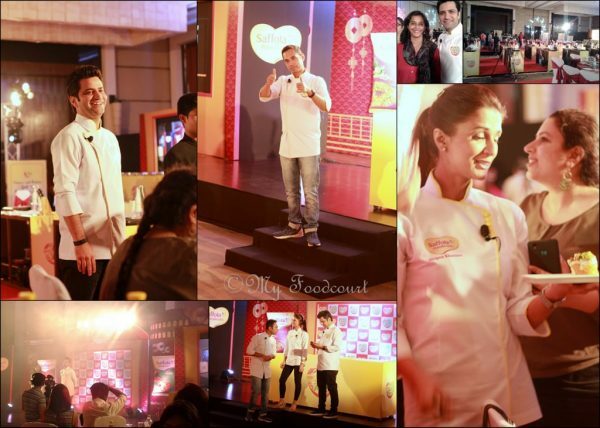 Wishing you and Medha a super awesome years ahead in culinary world!